Nitrosigine® promotes focus, energy, pump, and recovery. Whether you’re trying to improve your performance or simply love getting that full, hard look at the gym, Nitro HD™ can help. Feel the effects in as little as 15 minutes and enjoy the benefits for up to six hours! 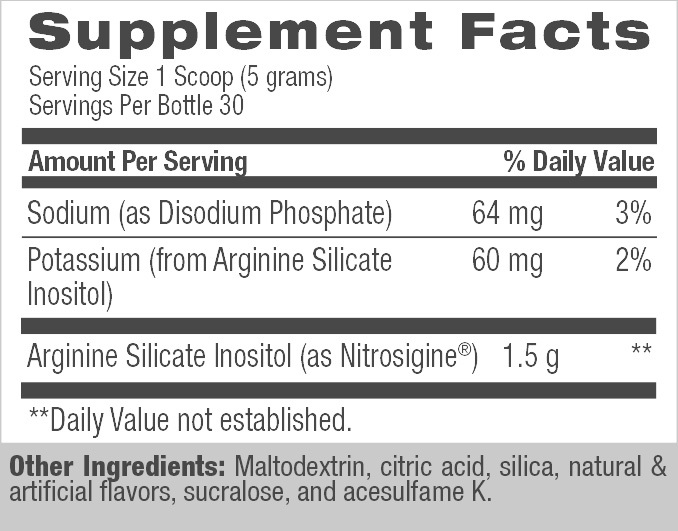 Nitrosigine® - Nitrosigine® is a patented dietary complex of bonded arginine silicate stabilized with inositol. In several studies, this clinically-substantiated ingredient was shown to enhance the levels of both arginine and nitric oxide in the blood. Can I stack Nitro HD™ with other supplements? Yes. Nitro HD™ is a non-stimulant supplement, so it can be stacked with your pre-workout or other pump products, like creatine. When should I take Nitro HD™? For best results, mix one scoop with 8 oz. of water, 15-30 minutes before training. Who should take Nitro HD™? Nitro HD™ is best for those looking to add an intense NO3 boost to their workout.